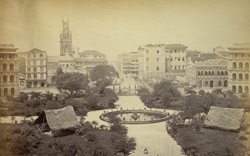 Photograph of Elphinstone Circle in Bombay from the 'Lee-Warner Collection: 'Bombay Presidency. William Lee Warner C.S.' taken by an unknown photographer in the 1870s. Elphinstone Circle was laid out in 1869 on the site of the old Bombay Green in the Fort area of the city. The buildings were designed by James Scott as part of the redevelopment of Bombay which began under the Governorship of Sir Bartle Frere in the 1860s. Following Independence, the Circle was renamed Horniman Circle. This name refers to Benjamin Horniman, an English journalist. This view shows the gardens and fountain in the centre of the Circle.